Join us during Whale Watching season as we marvel at these incredible creatures frolicking and swimming in the tranquil waters of the Pacific Ocean. 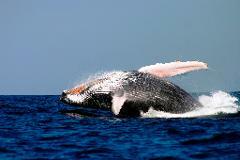 Whale watching off Sydney Heads is an exhilarating adventure, an awe inspiring treat that you will remember forever! The southern hemisphere humpback migration is estimated to be approx.. 30,000 whales this year, with an average increase of 11% per year, quite amazing considering these magnificent creatures were nearly hunted to the point of extinction 40 years ago. •	4 hour whale watching cruise from King St Wharf 9, along Sydney Harbour, out through Sydney Heads and return. •	Informative commentary on whales, their migration patterns and behaviour including a number of interesting facts and statistics. •	Hot breakfast served on board. Vegetarian and specific dietary requirements can be catered for with sufficient notice. •	Tea, Coffee and Water. •	Vessel the “Jerry Bailey” capable of carrying 180 pax with the number limited to 95 pax on whale watching tours to ensure everyone has a good vantage point. Fully qualified crew on board. •	Comfortable vessel with multiple outside viewing areas, indoor lounge area and licensed bar for beverages (extra charge). The boat departs from King Street Wharf 9, Lime st, Sydney. The wharf is outside the bar called Cargo Bar.